Maintaining your Diesel Trucks's air conditioning system means that you always need to have enough refrigerant to properly do the job. Small leaks in the air conditioning system allow the refrigerant to escape and the system can’t cool the air as well. At Raul's Auto Repair, we inspect the air conditioning system and other components are checked for proper operation. We also perform leak test. If a leak is detected, often in a hose or connection, it’s repaired and then your Diesel Truck's system is retested. Your Raul’s Auto Repair technician will also perform a temperature drop test to ensure that you A/C is functioning and delivering cold air. We also provide complete service and maintenance for all Diesel Truck models and use Genuine Diesel Truck parts. We are now offering our services to the areas of Azusa, Glendora, Covina, West Covina, San Dimas, Baldwin Park, Irwindale, Rancho Cucamonga, Claremont , Diamond Bar , LaVerne and Monrovia. Give us a call or click here to set up an appointment, you'll be glad you did! While your vehicle is at our shop, we will also perform a Multi-Point Inspection on your car, truck or SUV and make sure all of the major systems are in good working order. Nationwide Peace of Mind Warranty for Diesel Trucks! We are a NAPA Auto Care Center and use quality NAPA parts and OEM parts, we offer only the best warranty at our shop servicing Diamond Bar. 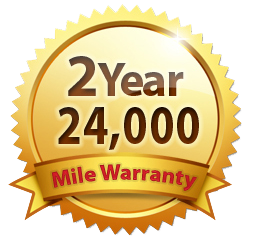 Each repair at Rauls Auto Repair comes with a 2 year or 24,000 Mile Warranty (whichever comes first). This warranty helps you anywhere in the nation at over 13,000 NAPA Auto Care Centers. All your Hybrid service and repairs are cover nation wide. See manager warranty terms.